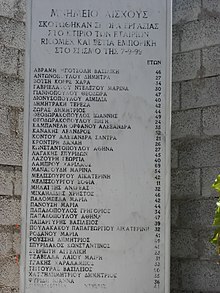 The 1999 Athens earthquake occurred on September 7 at 14:56:51 local time near Mount Parnitha in Greece with a moment magnitude of 6.0 and a maximum Mercalli intensity of IX (Violent). The proximity to the Athens metropolitan area resulted in widespread structural damage, mainly to the nearby towns of Ano Liossia, Acharnes, Fyli and Thrakomakedones as well as to the northern Athenian suburbs of Kifissia, Metamorfosi, Kamatero and Nea Philadelphia. More than 100 buildings (including three major factories) across those areas collapsed trapping scores of victims under their rubble while dozens more were severely damaged. With damage estimated at $3–4.2 billion, 143 people lost their lives, and up to 1,600 were treated for injuries in Greece's deadliest natural disaster in almost half a century. The 1999 quake was the most devastating and costly natural disaster to hit the country in nearly 20 years. 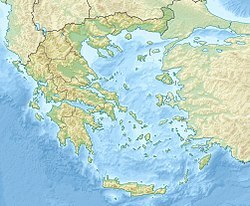 The last major earthquake to hit Athens took place on February 24, 1981, near the Alkyonides Islands of the Corinthian Gulf, some 87 km to the west of the Greek capital. Registering a moment magnitude of 6.7, the 1981 earthquake had resulted in the deaths of 20 people and considerable and widespread structural damage in the city of Corinth, nearby towns and sections of Athens' western suburbs. Apart from the proximity of the epicenter to the Athens Metropolitan Area, this quake also featured a very shallow hypocenter combined with unusually high ground accelerations. Unexpectedly heavy damage also affected the town of Adames. The Acropolis of Athens and the rest of the city's famous ancient monuments escaped the disaster either totally unharmed or suffering only minor damage. A landslide as well as several fissures were reported along the road leading to the peak of Mount Parnitha. Minor damage was also reported to water and waste networks close to the epicenter. This event took Greek seismologists by surprise as it came from a previously unknown fault, originating in an area that was for a long time considered of a particularly low seismicity. The highest recorded peak ground acceleration was 0.3g, at 15 km from the epicentre, with attenuation predicting 0.6g acceleration at the centre. The tremor took place less than a month after a (much larger in scale) Turkish disaster. This peculiar succession of earthquakes and mutual help of both countries gave rise to talks about what became known as the "Greek-Turkish earthquake diplomacy", in hopes for a breakthrough in bilateral relations, which had been marred by decades of hostility. Turkey reciprocated the aid rendered by Greece immediately following the August 17, 1999 Turkish earthquake. A special taskforce was formed, consisting of the Undersecretariat of the Prime Ministry, the Turkish Armed Forces, the Ministries of Foreign Affairs and of Internal Affairs and the Greek Embassy in Ankara was contacted. The Turkish aid was the first to arrive in the affected areas, with the first 20-person rescue team arriving in Athens within 13 hours after the earthquake struck. The Greek consulates and the embassy in Turkey had their phone lines jammed with Turkish citizens offering blood donations. ^ Anastasiadis A. N.; et al. "The Athens (Greece) Earthquake of September 7, 1999: Preliminary Report on Strong Motion Data and Structural Response". Institute of Engineering Seismology and Earthquake Engineering. MCEER. Retrieved 22 March 2011. Br J Surg. 2004 Dec;91(12):1633–40. Autopsy findings from 111 deaths in the 1999 Athens earthquake as a basis for auditing the emergency response. Papadopoulos IN1, Kanakaris N, Triantafillidis A, Stefanakos J, Kainourgios A, Leukidis C.
Pavlides, S., Papadopoulos, G. A., and Ganas, A., 1999. The 7th September 1999 unexpected earthquake of Athens: Preliminary results on the seismotectonic environment, 1st Conf. Advances in Natural Hazards Mitigation: Experiences from Europe and Japan, Programme-Abstracts-Reports, Athens, 3–4 November 1999, 80–85. Ganas, A.; Papadopoulos, G.; Pavlides, S. B. (2001). "The 7th September 1999 Athens 5.9 Ms earthquake: remote sensing and digital elevation model inputs towards identifying the seismic fault". International Journal of Remote Sensing. 22 (1): 191–196. Bibcode:2001IJRS...22..191G. doi:10.1080/014311601750038938. 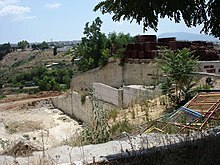 Wikimedia Commons has media related to Earthquakes of Athens 1999.